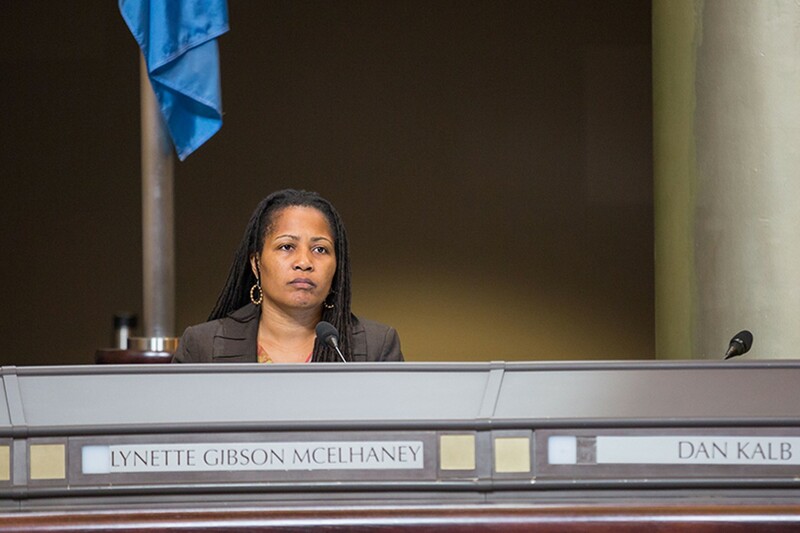 Lynette Gibson McElhaney is the president of the Oakland City Council. At the April 5 meeting of the Oakland City Council, I introduced an ordinance to enact a temporary rent moratorium in Oakland, in response to the ongoing rental housing crisis, and also in response to a request made by members of the public and a coalition of organizations that includes the Oakland Tenants Union, the Oakland Alliance, the Wellstone Democratic Club, and others. This ninety-day, emergency moratorium on no-cause evictions and rent increases will provide additional protections to tenants by temporarily prohibiting large rent increases and expanding rent control to cover more eligible units. The intention of this moratorium is to take immediate action to protect members of the public during this housing crisis, while buying city staff and the council additional time to reform and overhaul the existing system of renter protections. This proposed rent moratorium is an acknowledgment of the housing crisis, and I am committed to it being the leading edge of a slate of meaningful renter protections that will stabilize the housing of many Oakland families. There is no dispute that many Oaklanders are suffering under rapidly escalating rent increases. Oakland's current rent stabilization program is not adequate to provide protections to tenants, or guidance to landlords seeking to comply with the law. The result is that while Oakland has approximately half as many rental units as San Francisco, our city has twice as many evictions. The true scope of illegal rent increases in Oakland is unknown, but a recent study of Los Angeles' rent control and just cause for eviction regulations — which are very similar to Oakland's rules — recently found that 27 percent of tenants were being illegally overcharged on their rent compared to only 5 percent in Berkeley. On September 21, 2015 the City Council approved and accepted the Housing Equity Roadmap, a report drafted by city staff in conjunction with PolicyLink, Enterprise Foundation and the Urban Strategies Council. The roadmap made several recommendations regarding how to avoid rapid displacement of long-tenured residents with a particular focus on low income families. Based on that report, several members of the city council have begun working with the city administration, community groups and non-profits to draft enabling legislation to address the concerns. On March 8 the city released a complimentary set of policy recommendations in "Oakland at Home" a report prepared by Enterprise Partners in partnership with over one-hundred volunteers, housing professionals and members of the city council. Like the roadmap, the Oakland At Home report makes specific recommendations to the council designed to strengthen protections for tenants while continuing to spur housing creation in order to relieve pressure from existing units. Some of the recommendations from the roadmap and Oakland at Home reports have already been enacted by the city council, or are in process. One completed action is the relaxation of planning and zoning restrictions on building secondary units, which we hope will generate hundreds more low-cost units. Impact fees on new development will be coming to a final city council vote within the next month. Inequality in the labor market, a history of racism in housing policy, and decades of underbuilding created this current crisis. After years of lagging behind neighboring cities in terms of housing construction, Oakland now has the highest escalation of rents in the country. The price escalation has been especially rapid and alarming for existing tenants who are increasingly subject to double-digit increases. Extending and strengthening tenant protections is increasingly needed as Oakland's existing rental stock transfers into the hands of owners who may not know our laws. Real challenges persist at the state and federal levels where funding for housing and incentives to build are missing. Oakland will need to add our voice to the growing number of cities demanding reform and resources to address the severe housing shortage that threatens to destroy the very culture that attracts residents and businesses to our Golden State. The ordinance that I brought to the city council gives policymakers the ability to complete their deliberations over a range of needed reforms identified in the analytical reports issued by the city including: revisions to the condominium conversion and rent stabilization ordinances; protections for boarding houses that act as housing of last resort; and an improved local preference ordinance to ensure Oaklanders get first choice in affordable housing in Oakland. During this temporary moratorium, I encourage landlords, tenants, advocates and the public to constructively engage with the council to reform our rent stabilization system so that we can provide real protections to tenants in a manner that is also fair and responsible to landlords.